'Ugly', I thought to myself when I first saw the Granpasso in the flesh. Then I read somewhere that the Italian designer who created it wanted it to look like an ugly bird. Something like a vulture. Well, success! But once I rode Moto Morini's adventure tourer I realised that it isn't as ugly as I thought it was. It just has a really odd front-end on an otherwise chiseled and appealing motorcycle. And that like all the other motorcycles powered by the Morini CorsaCorta engine, there's an essential madness to the Granpasso that you will absolutely love. Like all the Morinis, the Granpasso also uses the 1187cc 87 degree V-Twin that is blessed with a wonderfully robust torque output and at 117PS, not an inconsequential amount of power either. Morini's Corsaro - regarded as an Arkham Asylum style mad motorcycle - uses the 140PS version of the engine. But unlike the Scrambler (page our previous story), the Granpasso is not supposed to be an explosion that can transport riders between places. The Granpasso is an adventure tourer. Which means it is supposed to be able to go anywhere your fancy takes you. In some ways, it is a pretty serious adventure tourer. You can see the focus in its standard 19-inch wheel. In the heavy duty Excel rims which can take knobbies if you need them to, but wear tubeless street tyres as standard. Also notice the comprehensive bash plate that's not some namby-pamby plastic job. That's sheet metal that is. Whether you're up to wrestling a 210kg (without fuel) motorcycle off-road is another question of course, if you wanted to, the Granpasso would certainly not be a shrinking violet. On the road, the Granpasso is actually marvellous to ride. The engine has more torque than you can imagine. And unlike the Scrambler it doesn't have that hair-trigger throttle-thrust connection. 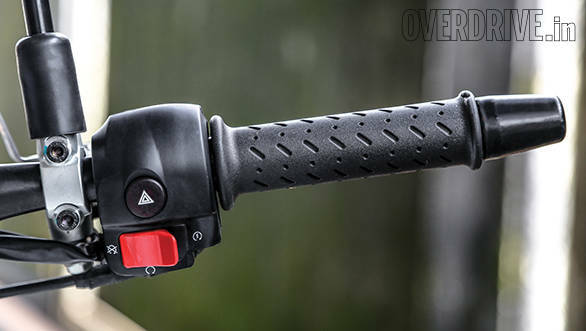 The throttle on the Granpasso is alert enough to feel completely natural and super responsive without becoming hard work or too sensitive for comfort. Which is a good thing, because the engine might feel like it's outgrown its hyperactive dobermann puppy phase and become a muscled german shepherd but it packs a punishing bite when provoked. Riding around Mumbai, the motorcycle feels invincible. No gap is too small or too far away because the acceleration is intense and immediate. 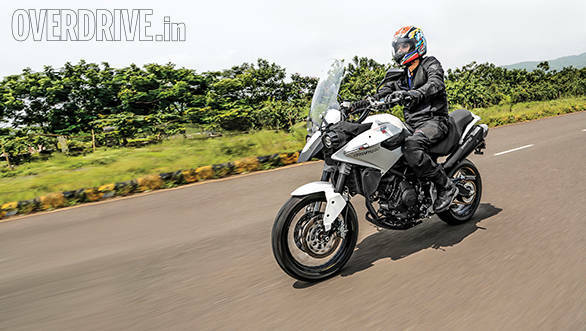 Like the Scrambler, but in a much calmer, more mature fashion, the Granpasso can add 70-80kmph to the speedometer in an instant which makes riding it great fun. But it doesn't have to be intense if you don't want it to be. Part of it is the gearing once again. The Granpasso (and the Scrambler) use identical, low gearing which allows them electric acceleration while foregoing top speeds which, in our world, are little more than brag swag. The Granpasso will hit 235kmph or thereabouts flatout, if you're wondering. The calmness comes mostly from the slight difference in engine tune and a much more rational throttle cam. Floating blissfully in the calm cocoon behind that tall, mechanically adjustable screen, I caught myself holding an effortless 140-150kmph on deserted roads. As I slowed back to more legal speeds, I realised that the engine makes progress so easy, so effortless that you really do have to watch the speedo. It is also comparatively silent (especially when the Scrambler is around) which makes your speed sense more inclined to under-read. When you go to full gas, the intake roar is there and the sound is distinctive and is perhaps squarely responsible for my high speed transgression. And I'm reliably told that the Granpasso loves a good wheelie too. Notice I'm not bringing up the suite of chassis, suspension and safety electronics. Well there aren't any. This is old school. You're in-charge. There is a slipper clutch but no ABS, traction control. Want the brakes to not lock? Finesse your fingers. Want traction control? Use your wrist well. But the fascination with this engine and its rather forceful character shouldn't hide the Granpasso's other charms. The chassis, a trellis by Verlicchi is another excellent piece of work. 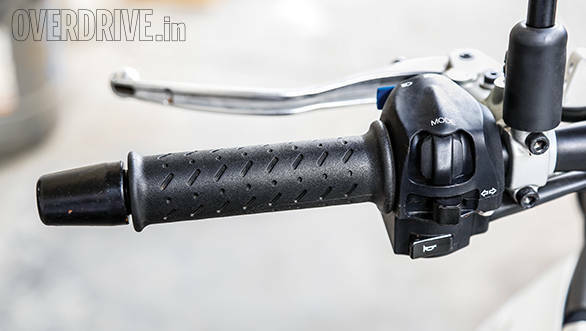 Suspended by adjustable Marzocchi forks at the front and adjustable Ohlins at the back, the Granpasso is also a spectacular cornering machine. You don't initially think it is, though. You sit tall and the torque is very much like a smooth dirtbike and the latter can wallow around tarmac corners. Plus the height is supposed to rob you of contact patch feel. But all this just doesn't happen to the Granpasso. Whether you're loping around the corner or on the gas like it's the last corner of a race, the Granpasso is planted. The suspension works really, really well and allows only the small amount of chassis pitch needed to get the rear tyre biting down and pushing forward. You realise the beauty of this when you unknowingly jump the first speed breaker and experience the wonderfully soft landing. It's like falling into one of the those sponge-filled pools for the tots to play in at malls. How they've tuned the suspension to corner with such poise while allowing this kind of sweet absorption of large bumps is beyond me. On the other hand, since it is adjustable, you should be able to find a setting that works for you. Vardenchi's new facilities are in an industrial area in Navi Mumbai where new concrete roads are interspersed with roads shattered by a combination of monsoon, municipal neglect and construction. The Granpasso takes this battering in such unflappable style while the engine hammers along with such gusto that you'd think Moto Morini designed it for our conditions. The Granpasso, then, is a lovely motorcycle with a face that you'll remember even if you do not like it. 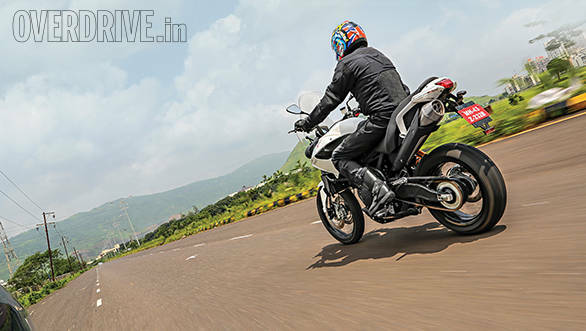 Compared to the bedrock of the segment, the BMW R1200GS, I think the big thing is that the BMW has a sense of peace and quiet about it that the Granpasso doesn't. The Granpasso isn't happy being in the background of the ride. 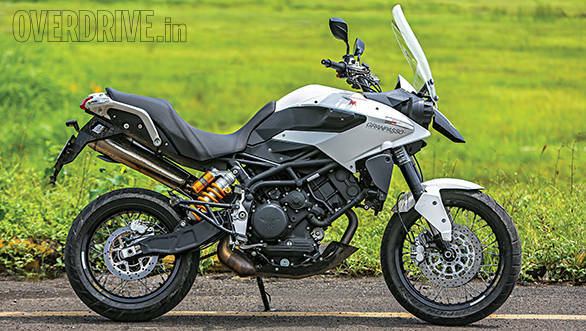 Vardenchi will eventually sell most if not all Moto Morinis in India and this Granpasso and the Scrambler are the first two models they will open with. As a boutique Italian brand, the bikes are going to be expensive and therefore, also rare. But having ridden two of them (see previous story for the Scrambler's tale), I can tell you that the Moto Morini engine is spectacular and their motorcycles have something honest and out of the ordinary about them that allows them to reach in and prod your emotions awake. 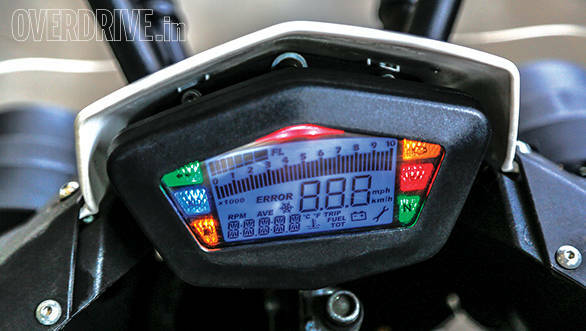 Perhaps it is just that since Moto Morini is a small brand, with a small outfit, it doesn't have the resources and plans to make motorcycles that are all things to all people. And I thank the Lord for that.